A review of Waiting for Citizenship—Pragmatics of Belonging of Burundian Refugees in Protracted Exile: The Case of Ulyankulu Settlement, Tanzania, by Janna Lucia Miletzki. In her dissertation, Janna Miletzki examines how refugees in Ulyankulu settlement, Tanzania, have developed a sense of belonging and de facto citizenship through their agency despite government control. This thesis is set in the context of protracted displacement of Burundian refugees and Tanzania’s recent decision to grant them citizenship. The author describes and theorizes various forms of control over refugees in relation to refugees’ strategies of belonging and waiting. As such, the dissertation contributes to forced migration literature by bringing attention to the bottom-up practices of local integration. The original contribution of this thesis lies in its consideration of spatiality and temporality in the interplay between exclusion from citizenship and a sense of belonging developed in the space of a refugee camp. After a review of relevant literature in Chapter 2, Miletzki presents her methodology and research design in Chapter 3. Here, she introduces how data for her dissertation was collected and analyzed. Her research is based on qualitative field research methods using techniques such as participant observation and interviews with refugees, Tanzanian citizens, agents of humanitarian organizations and the government in Ulyankulu settlement and Dar es Salaam. In total, Miletzki conducted 117 interviews in individual interviews (95) and group settings (5 groups, 22 respondents in total). In addition, various conversations took place in informal settings that sometimes led to formal interviews. Details about gender, occupation, and general location and month of the interviews can be found in the appendix. The author also made use of secondary sources, such as population statistics about the settlement collected from various institutions, maps and charts, newspaper articles, and parliamentary debates. In the analysis, which comes in the following chapters, the author evaluates practices and narratives of first and second generation refugees concerning their experiences of waiting for citizenship, and everyday negotiations of belonging. In Chapter 4 Miletzki describes the evolution of Tanzania’s refugee policy and the changing phases of organization and governance of Ulyankulu settlement. The chronological narrative of Tanzania’s approach to hosting refugees is quite well established, however Miletzki’s account of the history of the area of Ulyankulu provides an original contribution. A local perspective on Ulyankulu settlement before and after the refugees’ arrival opens spaces for asking questions about the historical legacy of the areas in which refugee camps are established. A detailed discussion of the transformations of settlements’ governance elicits the extent to which refugees have been excluded from citizenship as well as ways in which they have been included in a process of becoming citizens. The chapter explores the dialectic of exclusion and inclusion, elucidating the inconsistencies and spatial complexities of a refugee camp. The tension between exclusion and belonging is further elaborated in Chapter 5. Miletzki discusses elements of control that have been employed to exclude refugees in the settlement from citizenship by the government and international organisations, as well as the effects of this control and how has it been mitigated and transformed locally. The author discusses how, in the absence of clear bordered, control was exerted with military force and violence to enforce the separation of refugees. The proposed naturalization and granting of citizenship to Burundian refugees was initially meant to be contingent on relocation of refugees to other areas of the country. The assumptions of the relocation policy became controversial and ignited debates about purity and security at different levels of government. Drawing both on primary and secondary sources, Miletzki skillfully navigates and analyses discourses of criminality and control that arose in the context of naturalization. In the last section of the chapter the author describes how refugees and Tanzanians achieved a certain degree of conviviality. Although this arrangement did not completely alter the power relations between refugees and the officials, it nonetheless granted the refugees some space for establishing a sense of familiarity and stability. The last analytical chapter of the thesis examines the ways in which the settlement offered the first and second generation refugees a possibility to develop a sense of belonging and to claim de facto citizenship. While the previous chapters focused more on how control has been exerted in the settlement by various actors, Chpater 6 explains in detail how refugees have dealt with these constraints. The author argues that refugees have developed a “pragmatics of belonging,” which consists of three dimensions: a relational one based on mutual recognition between refugees and citizens, a dimension of feeling at home, and a dimension of claiming de facto citizenship rights. The final section of the chapter is specifically concerned with the “pragmatics of waiting,” illuminating refugees’ future-oriented approach to dealing with uncertainty. From a theoretical point of view, many of the earlier interventions (most noteably, Giorgio Agamben, 1998) examined refugee camps as spaces of exception and intensified biopolitical control, largely relying on Foucauldian interpretations of biopolitcs. Today, this point of view has been replaced by an emphasis on camps as active arenas of agency in which refugees resist their marginalisation, both in military and mundane ways (e.g. Adam Ramadan, 2012). Miletzki’s empirical study positions itself in these debates, providing insightful empirical evidence of the dialectic between exclusion and belonging. The study also puts forward policy recommendations, including final dissolution of control over the space of the settlement and recognition of former refugees’ new status. The author advocates for transformation of camps into genuine living spaces for refugees and their hosts in other comparable protracted refugee situations. 117 in-depth interviews with refugees, Tanzanian citizens, agents of humanitarian organizations and the government in Ulyankulu settlement and Dar es Salaam. London School of Economics and Political Science. 2015. 312 pp. Primary Advisor: Claire Mercer. 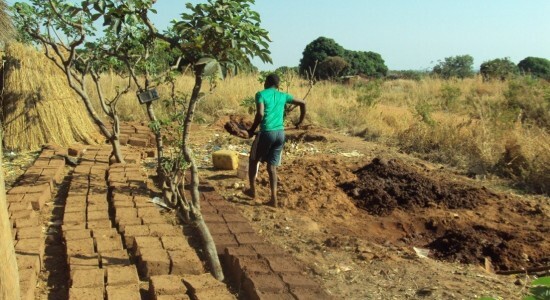 Image: Man building a house in Ulyankulu, Tanzania by Dr. Janna Miletzk.